How does it write? I don't know, and I don't bother with steel nibs. I like my broad edged nibs, home ground to perfection. Both pens will be used for donation for other nib sections that I have interest in. Edited by _InkyFingers, 01 November 2016 - 22:34. Does the Wing Sung use a standard sized nib? Thanks for your post InkyFingers. Do you think you can you swap a #5 Jowo or Bock nib into the Wing Sung, or you need something similar to a Pilot Plumix, 78G, Metropolitan or Prera nib as a replacement nib? Edited by Frank66, 02 November 2016 - 09:57. 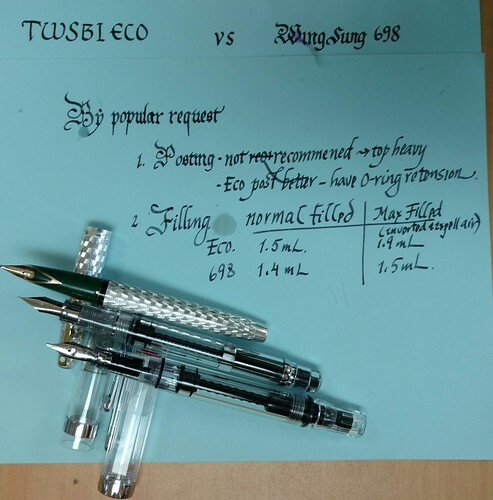 I thought the wingsung was inspired by the twsbi diamond 580 and not the eco. Am I wrong? At 15.75$usd when you get 6 per pack. As for nibs, I have no interest in nib swap. I rather use a different feed and nib and possibly section. 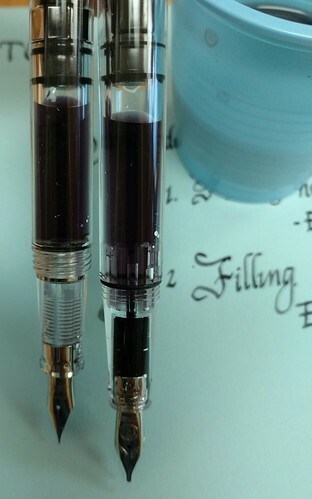 Would you be willing to ink them both up and show us the larger capacity of the Wing-Sung and how the ink looks near the feed? If they had it in a medium I would give the Wing Sung a try. I would also like to know whether the Wing Sung uses Pilot 78G clone nib & feeds, and also hw well it posts? 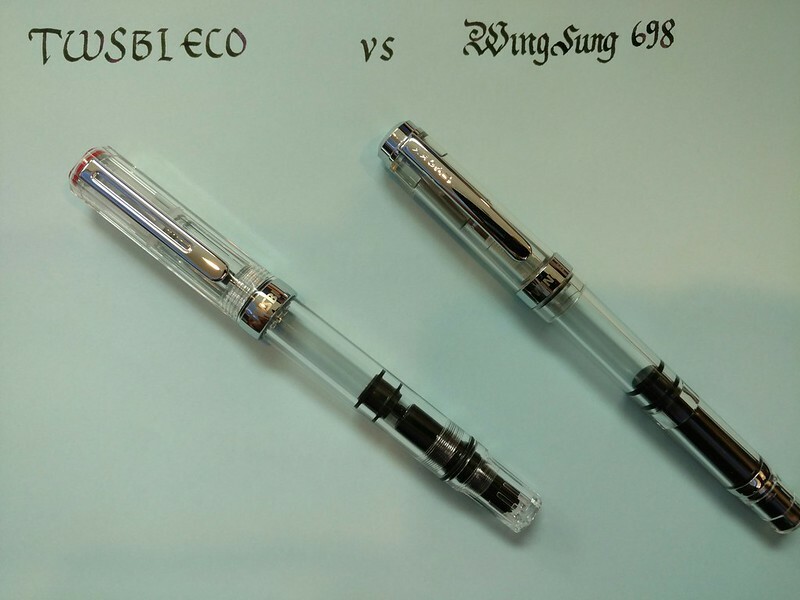 The Wing Sung 698 is compatible with Pilot "Super Quality" nibs, same as the Wing Sung 659. This includes F/M from the Metropolitan/Kakuno/Prera, EF from the Penmanship, medium italic from the Plumix/Prera, and B/BB italics from the 78G (though the feed may not be able to keep up with the latter). The pen posts fine but you can accidentally turn the piston nob so I wouldn't suggest doing so. That said it's a long-ish pen at ~13CM/5.1" unposted so it shouldn't be necessary for most people. It also comes with a little stoppered converter filled with silicon grease for maintenance. Edit: I should note that I measured the ink capacity at ~1.6ml. Pretty good if you ask me. Edited by jekostas, 04 November 2016 - 21:57. Regular Fill: Dipped & twist. Max Fill: Dipped & Twist; Invert the pen; Expelled air; Dipped & Twist. I was surprised of this outcome....Way to go Eco! But price-wise....698 ANYTIME. Edited by _InkyFingers, 05 November 2016 - 00:09. I've just ordered a Wing Sung 659 - it was 1/3 the price, though it's not a piston filler, and I thought a better place to dive in to the brand. Good to hear that it's compatible with Pilot Metro/Plumix/Penmanship etc! It's actually quite a surprise to see a piston filler from the mainland, as it's not a particularly common type; the last piston filler I am aware of was by Ta Tung which, of course, was acquired by Wing Sung. 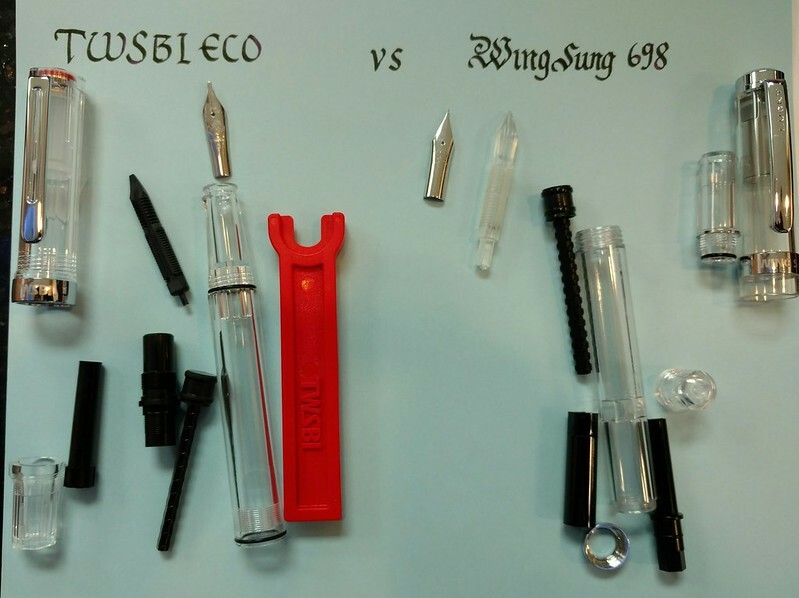 While TWSBI favours a piston mechanism of regular type, requiring the wrench to disassemble, I do not know what the Wing Sung 698 uses: is it a clutchless type similar to the Nib Creaper and Konrad? The piston mechanism isn't screwed in to the barrel, it's kept in place by a screw down metal trim ring (visible in Inkyfingers' photos). It's not a clutchless mechanism, but it's different from TWSBI's design. Just to say I ordered one when I saw this thread and it arrived late last week, I got around to testing it yesterday and was immediately impressed - the standard F nib was incredibly smooth and a joy to write with straight away, no messing with Micromesh or anything The price (after USD to GBP conversion) meant that it was just about 57% what a TWSBI Eco retails for in the UK (£28). I have a TWSBI Eco with a 1.1 nib so it is hard to compare directly, but the Hero 698 is a big step up in quality and feel from the 659 (which I also have) . Right now, I'm enjoying the Hero nib so much I am not tempted to try and replace with a Pilot nib. So much, in fact, that I've just ordered another in EF. Interesting to know that the F nib on yours works to your satisfaction. 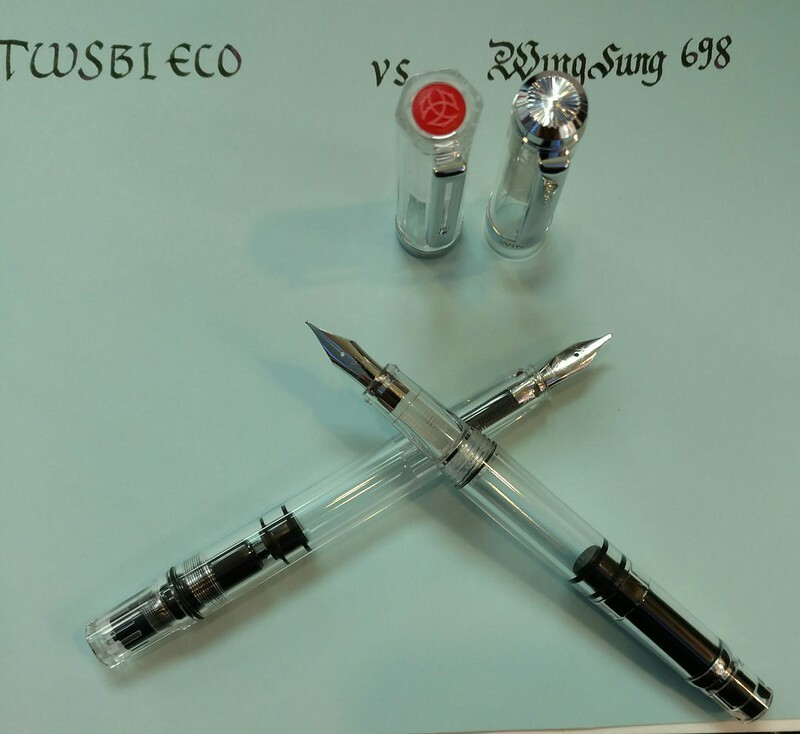 While I am waiting for mine to arrive (which I ordered in a rather convoluted manner), it's probably a good place for me to add that the revived Wing Sung brand, at least as instanced by this 698 and the C/C 659, are actually made by a Hero subsidiary, so I cannot tell if the nibs themselves are made at Hero's own facilities. That's interesting about the Hero subsidiary. My experience up until with Hero has been with their Parker 51 simulations and the nibs on those have been quite different - they invariably require work of some kind to get them to write well. I may well revisit the 659 as I don't think I have even dip tested that one, let alone inked it up properly. I have quite a few in the Pilot line - 78G, Prera, Pluminix and MR and liked particularly both their F and italic nibs. The 698 took me by surprise that it wrote so well 'out of the box'. I'll try and find time to give the 659 a go tonight.